I am back again because it's time for Challenge #273 at Little Red Wagon. Jan R is in charge of this week's challenge. She wants us to Shhhhh. Well, not you exactly. She wants our cards to have no words at all on them. Hmmmm. What a fun challenge! My image is from Meljen's Designs, colored with Copic markers. I added a few die cuts to complete my project. Although I didn't use any words, I think you can tell that this is a little valentine for one of my sweet grandsons. 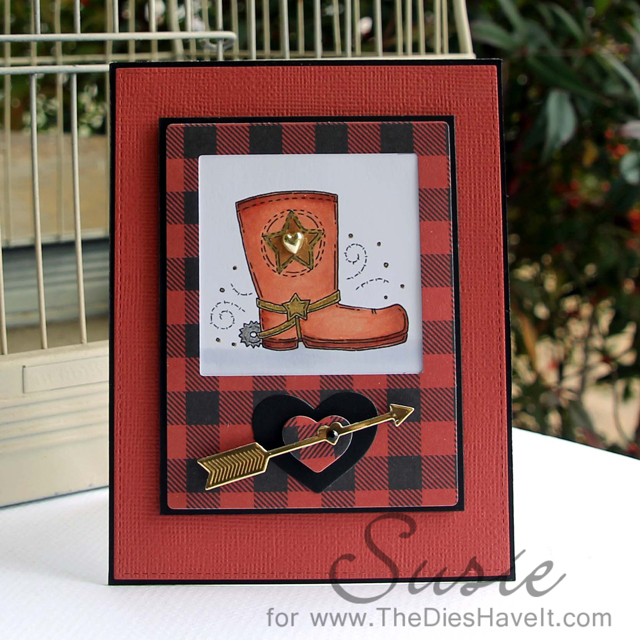 You can see Jan's card on the Little Red Wagon blog by clicking right here. Then be sure to check out what all the girlfriends have created for this challenge. The links are to the right (and then scroll down a little) of this post. Once you have been totally inspired, be sure to create your project and link it up on the Little Red Wagon blog. Be sure to shhhhh. Awesome card, Susie! I love the heart and arrow. I'm betting your grandson will adore this! Yee Haw!!! I love this!! Very cute and what a great card for a boy. Your card is so awesome! I know a couple of people that his would be perfect for!